Smart reports from the countercultural trenches, where ’60s veterans trudge onward. The subtitle is a little misleading, holding forth the promise of contrarian political analyses à la Hitchens or Cockburn, if a little than the usual Nation fare. Goldberg, a longtime music-industry exec and now CEO of the embattled Steve Earle’s Artemis label, gives readers principled arguments aplenty, but in the main, this is more personal than all that—it might better be subtitled, “How I Remained Rad and Mad While Everyone Else Became Yuppies.” Rad-mad Goldberg has indeed remained, fighting such good (if ultimately compromised) fights as the music industry’s efforts to buck the Tipper Gore–led crusade to sticker potentially offensive recordings. Tipper serves as a handy foil for Goldberg’s First Amendment absolutism throughout, as does her husband Al. “A major reason Gore lost in 2000,” Goldberg writes, neatly sidestepping the question of whether he lost at all, “was a very severe case of liberal snobbery. With his unwillingness or inability to communicate in ordinary language . . . his shrill attacks on popular culture, his selection of a running mate even more sanctimonious and elitist than he, and his obsessive need to distance himself from President Clinton, Gore turned off millions of voters he could have attracted.” And therein, in Goldberg’s feisty analysis, lies the problem with liberal/progressive politics in America: its elder practitioners have no interest in the young, are insulated from popular culture, are dreadful snobs, and have as little idea of the realities of working-class life as George Bush. The right, he continues, is far more at ease working the youth-culture angle, co-opting pop stars and movie idols to further its dark agenda. 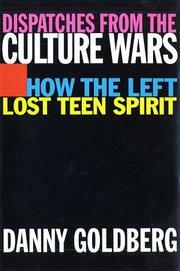 Throughout his winding narrative, which chronicles his sentimental education as an activist (and which music buffs will find much fun to read), Goldberg urges lefties to let down their hair and start trusting the under-30 crowd, whereupon a new age of Aquarius will descend on the land and the likes of Dubya will go unemployed. Members of the DNC will want to study up on this one.